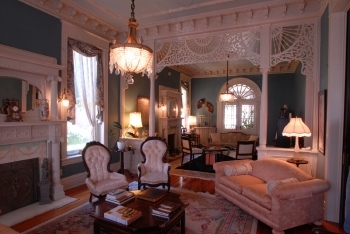 Grace Manor Inn is in the heart of the Historic Fan District of Richmond, Virginia, one block from Monument Avenue and walking distance to many restaurants and museums. The Capitol area, VCU, University of Richmond, and the Greater Richmond Convention Center are all within five miles of the Inn. For the theater lover, the Landmark Theater, Richmond Symphony and Virginia Opera are also only a short drive away. Our 7 day weather forecast for Richmond updated throughout the day, making it ideal for planning leisure activities, travel and events. Read more about our weather forecasts. On Sunday 21st April 2019 the sun will rise at 06:28 and will set at 19:51. It will be a mild day, with temperatures reaching around 17.9°C. Today is expected to be a dry day, with a very low chance of rain. There will be a gentle breeze in the air today, with a maximum expected wind speed of 13mph. On Monday 22nd April 2019 the sun will rise at 06:26 and will set at 19:52. It's going to be quite a warm day, with temperatures reaching 23°C. Today is expected to be a dry day, with a very low chance of rain. There will be a gentle breeze in the air today, with a maximum expected wind speed of 13mph. On Tuesday 23rd April 2019 the sun will rise at 06:25 and will set at 19:53. Today is epxected to be an extremely warm day and people are advised to stay hydrated and use sun protection if going outside. Temperatures today could reach as high as 28.4°C. Today is expected to be a dry day, with a very low chance of rain. There will be a gentle breeze in the air today, with a maximum expected wind speed of 15mph. On Wednesday 24th April 2019 the sun will rise at 06:24 and will set at 19:54. It's going to be quite a warm day, with temperatures reaching 26°C. Today is expected to be a dry day, with a very low chance of rain. It will be quite a breezy day, with a maximum expected wind speed of 13mph. On Thursday 25th April 2019 the sun will rise at 06:23 and will set at 19:55. It's going to be quite a warm day, with temperatures reaching 23.6°C. Today is expected to be a dry day, with a very low chance of rain. There will be a gentle breeze in the air today, with a maximum expected wind speed of 13mph. On Friday 26th April 2019 the sun will rise at 06:21 and will set at 19:56. It will be a mild day, with temperatures reaching around 22.7°C. Some moderate to heavy rain is expected, 7mm of rainfall is possible today. It will be quite a breezy day, with a maximum expected wind speed of 19mph. On Saturday 27th April 2019 the sun will rise at 06:20 and will set at 19:57. It will be a mild day, with temperatures reaching around 21.9°C. Today is expected to be a dry day, with a very low chance of rain. It will be quite a breezy day, with a maximum expected wind speed of 15mph. Our weather forecast for Richmond is updated throughout the day and has been found to be very reliable for planning activities such as days out, leisure, travel, events, fishing, golf and gardening.